The temperature is increasing here each day and juices and coolers are all I can think about to. On one such hot evening summer, this refreshing & quick lemonade came into existence. A refreshing drink with a blend of fresh mint leaves and zingy lime..! As we are immersed in the midst of peak summer, we try to find cooler waters options to dive into and escape from the scorching heat. And a glass of chilled and refreshing drink gets the highest vote! In my hometown guests are always welcomed with a refreshing drink that suits the season. The most common and popular drink has to be the nimbu sherbet (lime juice). A big jar of chilled sherbet is always greeted with warm smiles in hot summer months. And this drink finds its way during winter months too! All you have to do is just squeeze in some fresh lime juice to a jar of warm/ tepid water! This has been practiced for a long time now for the wide array of benefits lime offers. Freshly squeezed lime juice is an ideal remedy for cold and coughs besides improving digestion along with host of other benefits. 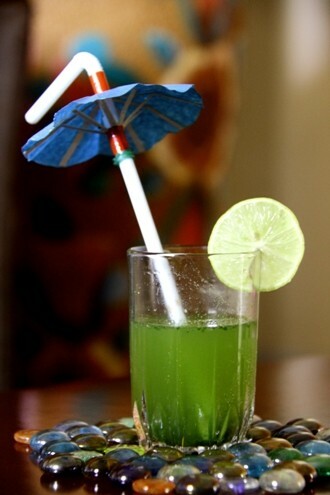 Here is a slight twist to this traditional drink with the addition of fresh, green mint leaves! The quantity of lime is less than the regular version but is enough to come through the minty flavor of the herbs. This herb is no far behind when it comes to health benefits. Mint leaves can aid digestion, stimulate senses, treat colds etc. A refreshing drink with a blend of fresh mint leaves with tangy lime. In a blender blend the fresh mint leaves, chopped ginger, lime juice till almost a paste. Then add in the water, sugar or honey to taste and blend for half a minute or till well combined. Serve chilled with some crushed ice. For a special touch, you may dip the rim of the serving glass in very little water and then immediately dip lightly in some salt. Then insert a lime slice in each glass, pour in the cooler and serve! You can make the same with only lime juice too. Just squeeze in more lime juice and sugar into a jar of chilled or even warm water. You may or may not add ginger juice, For a royal touch, also sprinkle few strands of saffron. The trees outside seem to be dancing and singing along with the breeze as it gently caresses the few remaining leaves. The birds seem to be a tad more cheerful in their singing than yesterday. And I suddenly want to join in sing along! Is it this pleasant weather that is inducing me to sing along with nature? Or is it that I feel cheerful and so the nature seems beautiful to me? Well, it is hard to say what weather it is in my hometown. For these days, every day is a season in itself! While it was a scorching hot day yesterday, its quite breezy and pleasant today. But I am sure the weather has more plans for the residents of this town for later in the day! The weather playing ‘guess-the-season-today’ is the perfect time to sit back and relax with a glass of chilled goodness of fruit. Staring at the wonders of nature with your loved ones or a good book is sure to soothe your senses!